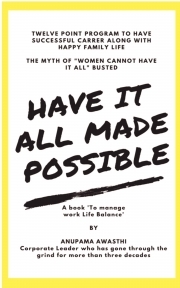 Description of "HAVE IT ALL MADE POSSIBLE"
A self-help guide for working women on how to "Have it All".
" Twelve point program" to achieve work-life balance. A must have for working women and a good read for anyone who is struggling with work-life balance. This book has very relevant and pragmatic tips to be successful in the career while managing kids and family responsibilities. Anupama Awasthi is an accomplished corporate leader who has wide experience of coaching senior managers to build and lead high-performance teams, drive organizational changes, optimize cost, manage tight project schedules and deliver an outstanding customer experience. Started her career as an engineer and rose through the ranks to middle management and senior leadership levels. She has led large global teams in a multicultural environment. She has always taken initiatives to improve gender diversity in the teams she led, coached many women professionals on work-life balance subject. What makes her unique is that she had managed these positions of high responsibilities and authority along with managing family and kids. Reviews of "HAVE IT ALL MADE POSSIBLE"
Have read several self help books but this one is so different from others majorly because it's coming from practical experience. The author has given such practical and easy to implement tips and as a working professional myself, I could relate to each and every word mentioned in the book. The best part is how to overcome the self guilt and keep on working towards our goals. Really Have it all made possible!! Thanks Anupama Awasthi for such great insights and allowing us to gain from your experience!! It hits the nail right on the head. Practical tips for working women to manage office and home at same time. Will be useful in professional as well as personal life. It resonated so well with many of the situations I have been in.